In the year 2000, the staff at 470 devised a competition to design and create a Squadron badge for the new Millennium. The premise was simple, create something which would be unique to the Squadron, the local area and maintain an aviation theme. 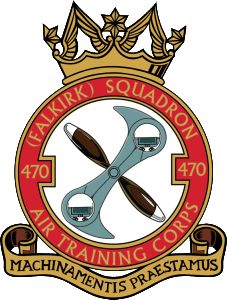 With the exception of RAF Grangemouth, Falkirk does not have a long aviation history to draw from so many of the ideas were a little out of the ordinary. One theme that proved to be popular was the Falkirk Wheel which was under construction at the time and was gathering a lot of media attention. The Squadrons WW1 propeller which has been mounted in the Main Hall of our Headquarters for over 50 years. This simple “round” design was used within the Squadron building for posters, polo shirts and other items but was not publically made available due to the unconventional nature of the design compared to other Squadron badges. In 2013 with more focus on the use of Social Media, the existing Squadron website was redeveloped and expanded. This called for the old design to be reimagined and brought in line with existing Squadron badges. As a result we also needed a Squadron motto which was selected by the cadets to be “Soaring High for a better future”. CI Marc Esson re-engineered the design elements using a template of a generic ATC Squadron badge in a commercial graphics package. This design was used throughout a successful media campaign which included new recruitment posters for schools, flyers and a large PVC banner for the HQ fence. At the end of 2014 the Squadron made a number of enquiries about seeking official recognition of the badge design from the Royal Air Force and the Royal College of Arms in London. So began a period of discussion between various parties from the Air Cadet HQ, RAF Ceremonial Office and College of Arms before the final design was signed off and sent away to be hand painted by an artist from the College. Part of the process also required us to update our motto which was changed to “Engineered to Succeed” which better reflects Falkirk’s long industrial heritage and our focus on technical subjects and STEM (Science Technology Engineering and Mathematics) as part of our training program. 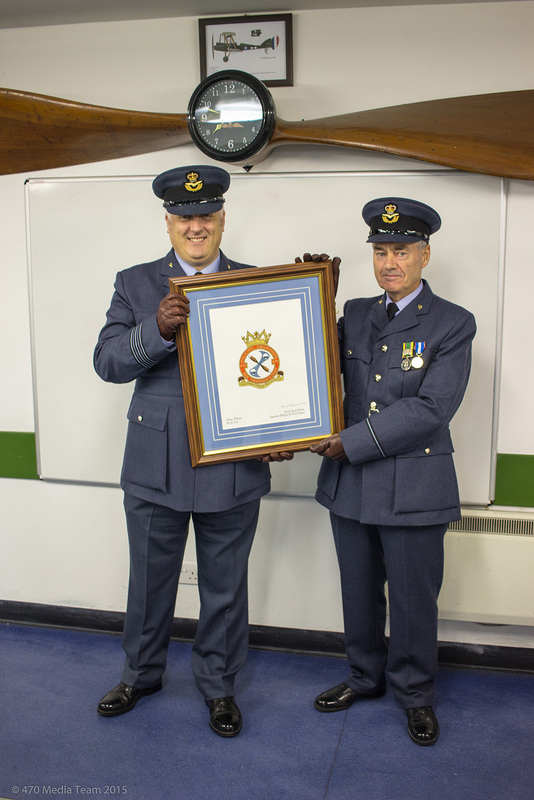 In 2015 we received the framed hand painted design which was officially handed over to the Squadron by the Commanding Officer of West Scotland Wing, Wing Commander Jim Haley at our Annual Inspection. 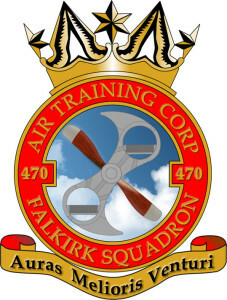 We are extremely proud to have a Squadron badge which has been officially endorsed by the appropriate authorities as there are very few squadrons in Scotland who have progressed with this.